Did you know that your purchase helps save lives? Proceeds from our children’s books about animal rescue are donated to animal charities. Every book makes a difference! We are committed to being an eco-friendly company. We use print-on-demand for all our books, which reduces paper and trim waste and unused inventory. Print-on-demand means that our shipping times take a little longer than average, but we feel that the environment is worth it. We also make additional donations to environmental charities as a way too offset our carbon footprint. 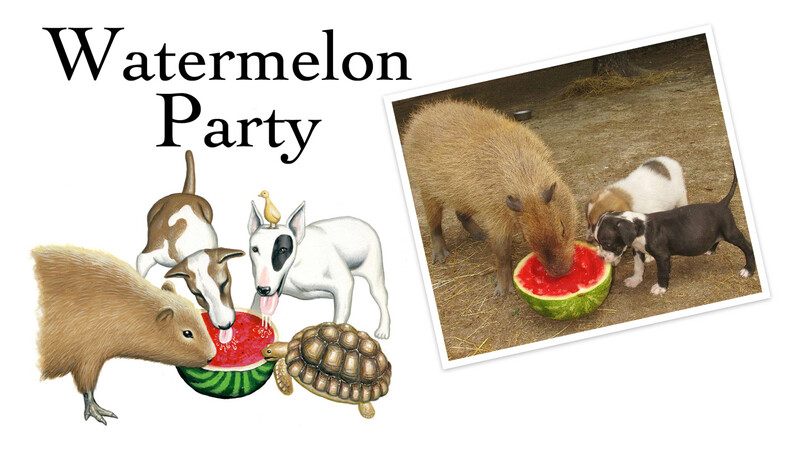 Watermelon Party is based on a real event that happened at Rocky Ridge Refuge. One July 4th, Janice put out a watermelon, and one by one the animals gathered around the watermelon, sharing in its juicy sweetness side by side, despite their differences in species and size. It is the perfect story of friendship, love, animal rescue, and good, old summertime fun! 100% of the profits from every book sale are donated to Rocky Ridge Refuge.